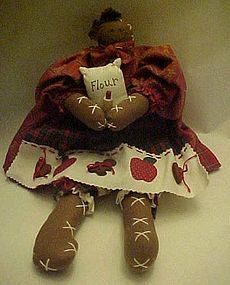 Pretty Calico bunny rabbit rag doll.Pretty red calico color dress. I am cleaning out my cabinets and have several beautiful preprinted panels for crafters. Makes a finished 22" tall rag doll. This pattern was probably discontinued in the 1990's also. Made by Daisy Kingdom. The colors make it nice for Christmas too. 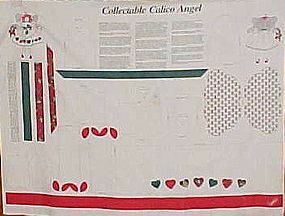 Pretty Calico angel rag doll.Great Southwestern theme coyote and cactus to sew and stuff. I used to make these and sell them. but as time goes by I find little time to do sewing. So I am cleaning out my cabinets and have several beautiful preprinted panels for crafters. 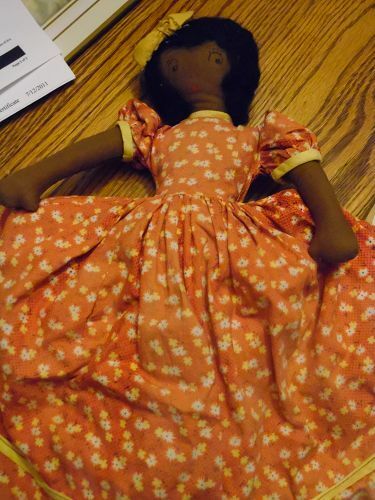 Makes a finished 16" tall rag doll. This pattern was probably discontinued in the 1990's also. Made by VIP Cranston. The colors make it nice for Christmas too. 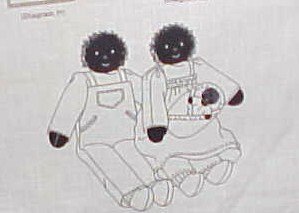 Adorable little black rag doll family. Mamma daddy and little baby, Largest dolls finished are about 9" tall. I used to make these and sell them. but as time goes by I find little time to do sewing. So I am cleaning out my cabinets and have several beautiful preprinted panels for crafters. Make nice gifts for Christmas, This is perfect for that special little child. Makes a finished 9x10 book. This pattern was probably discontinued in the 1990's also. Made by VIP Cranston. 2 panels available. I used to make these and sell them. but as time goes by I find little time to do sewing. So I am cleaning out my cabinets and have several beautiful preprinted panels for crafters. Make nice gifts for that special someone. Makes a finished 13" bear. This pattern was probably discontinued in the 1990's also. Made by VIP Cranston. I used to make these and sell them. but as time goes by I find little time to do sewing. So I am cleaning out my cabinets and have several beautiful preprinted panels for crafters. 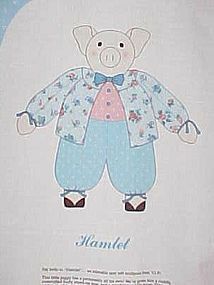 Make nice gifts for anyone, This Hamlet the pig rag Doll is perfect for that special little girl. This pattern was probably discontinued in the 1990's also. Made by Cranston. I used to make these and sell them. but as time goes by I find little time to do sewing. So I am cleaning out my cabinets and have several beautiful preprinted panels for crafters. 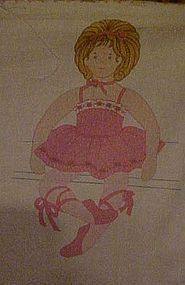 Make nice gifts for Christmas, This 23" tall Ballerina Doll is perfect for that special little girl. I have 3 panels available. Price is for each panel. 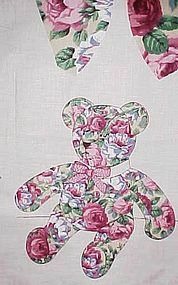 This pattern was probably discontinued in the 1990's also. Made by Cranston. You will love this quality made doll. 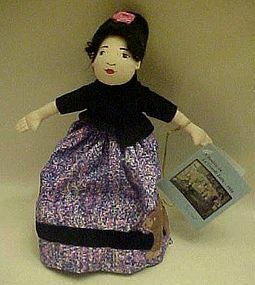 her hair is braided and embellished with little rags to match her calico dress. Muslin apron and pantaloons with a puffy heart o her apron to show her love/ Measures 15" tall and still has her original tag Handmade in USA by Creations by Viki of Indiana. She is perfect and quality made. Her eyes and mouth are embroiderd too. Nice, clean, no rips or repairs. 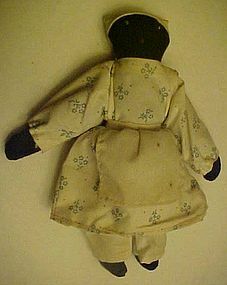 Little rag doll measures just 9 1/2" tall but she is cute. blue & white calico dress, muslin apron and matching pantaloons and head scarf. Simple embroidery eyes and mouth. Nice condition, and no rips or tears. Ready to travel to your kitchen. 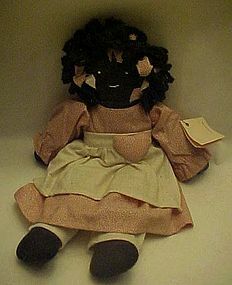 Crafyt little rag doll is black with plaid dress and pinafore. Embroidery accent cross stitch embellishments. 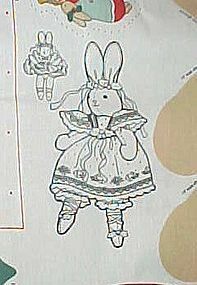 Dress trim has clay hearts and apple decoration, with matching clay hearts on her pantaloons. She holds a sack of flour and a rolling pin. Even her plaid dress has little machine embroidery gingerbread men in the plaid. Pinked edges on fabric. She is in brand new condition and nice and clean. She measures 12" tall. Itty bitty head and big old feet! lol... shes so darn cute! These would make a great gift for a child. 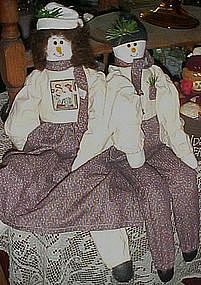 Two soft rag dolls are a matching pair of a boy and a girl snowman. Measures about 21" tall. Brand new condition complete with all the clothes. Adorable for decoration too. This adorable craft is so sweet. 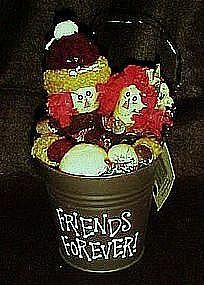 Little Raggedy Ann and Andy rag dolls sit in a metal bucket with snowballs and holly sprigs. There is a wire bail which you may hang it from, or sit it independantly. Metal bucket says "Friends Forever!" 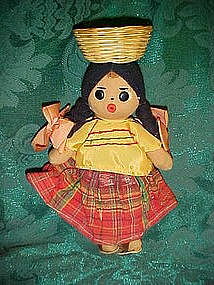 Measures 8" tall. Quality made by Hannah's Handiworks. Excellent with original hang tag. 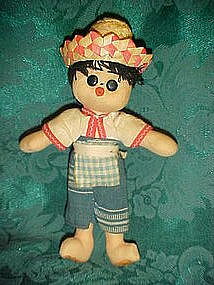 Cute little vintage cloth boy doll is stuffed with sawdust. He wears clothing native to Mexico or Central America and wears a straw hat. He is 9" tall including hat. He appears to be missing his sandals. Great condition.